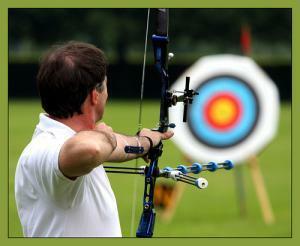 Archery at Pendine Outdoor Education Centre Archery Pendine outdoors is a residential activity centre 300m from the beach on the outskirts of the village. There are 120 beds in 'bunkrooms' and 18 beds in twin rooms, some en suite. We have ample shower and toilet facilities as well as secure parking. Pendine Outdoors is a 'residential activity centre' and is ideally located 300m from the famous Pendine Sands and at the start of the Pembrokeshire Coastal Path just 100m from the village centre with its shops, pubs and restaurants. Activities available include climbing, Abseiling (tower and crag). High and low rope courses, archery, sea based activities including Coasteering and Bushcraft based in our own Oak roundabout or in local 70 acre woodland. We also offer team building days for all ages. Security is paramount with 24hour CCTV and we have an AALS licence to instruct adventure activities to under 18's. We are members of the BMC and Canoe Wales. We offer accommodation to groups between 8 and 130+ by pre booking. Self catering facilities are very basic and most booking are on a food serviced basis. Pendine outdoors is a residential activity centre 300m from the beach on the outskirts of the village. There are 120 beds in 'bunkrooms' and 18 beds in twin rooms, some en suite.